The California State Athletic Commission has just released the official paydays for all of the contestants that participated in “UFC 117: Silva vs. Sonnen” on August 7th in Oakland. Middleweight king Anderson Silva pulled off a miraculous come-from-behind submission victory over challenger Chael Sonnen in the card’s featured attraction. Despite getting dominated for the majority of their instant classic, “The Spider” had his prays answers with only 110 ticks remaining in the 5thRound to notch his seventh consecutive title defense. The Brazilian and UFC Hall of Famer Matt Hughes were the card’s highest paid athletes. 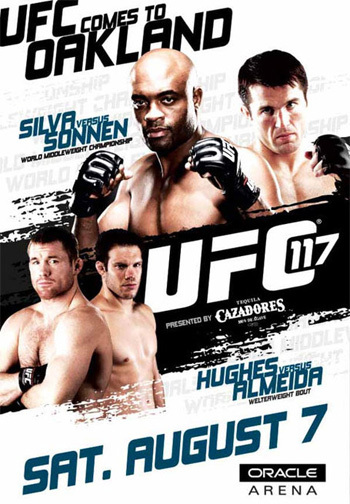 However, half of Hughes’ salary came via win bonus while Silva received a flat $200,000 salary for his performance. Despite his uncanny ability to sell a pay-per-view event, Sonnen only pocketed 35k for his pre-fight comedy tour and valiant effort inside Oracle Arena in Oaktown. Please keep in mind, the numbers that get reported to the athletic commissions are only of what’s required. These figures do not include deductions for items such as insurance, licenses and taxes. Additionally, they do not contain money paid by sponsors or any bonuses from the UFC. These royalties can include pay-per-view commissions, Fight Night bonuses, secret somethin’ somethin’ handshakes, etc., which can oftentimes represent a substantial portion of a fighter’s total income.